When the deepest part of you becomes engaged in what you are doing, when your activities and actions become gratifying and purposeful, when what you do serves both yourself and others, when you do not tire within because you are pursuing the sweet satisfaction of your life and your work, you are living life the way it is meant to be lived. Sometimes it’s the smallest decisions that can change your life forever. Here are some small, deadly decisions to avoid on your journey forward. Not loving what is. – Love what you do, until you can do what you love. Love where you are, until you can be where you love. Love the people you are with, until you can be with the people you love most. This is the way we find happiness. Read The How of Happiness . Changing who you are because others have changed. – People change. Get used to it. Accept it. Wish them well anyway. Be happy anyway. If you’re being true to yourself and it isn’t enough for the people around you, change the people around you. Letting heartache define you. – Don’t allow your temporary wounds to permanently transform you into someone you aren’t. A strong person is not the one who doesn’t cry. A strong person is the one who cries for a moment openly, and then gets up and fights again for what they believe in. Running away from problems. – Running away from your problems is a race you’ll never win. You may not be proud of all the things you’ve done in the past, but right now is a new beginning. It’s doesn’t matter who you used to be; what matters is who you are today. What you do TODAY can improve all of your tomorrows. So don’t run; instead do something that creates positive change. Being ungrateful. – Even in the most peaceful surroundings, the ungrateful heart finds trouble. Even in the most troublesome surroundings, the grateful heart finds peace. Choose to see the world through grateful eyes; it will never look the same again. Allowing long-term anger to occupy your heart. – The best medicine is a strong dose of love, laughter and letting go. Just like we would never allow even a tiny bit of poison to be in our food, let us not allow even a tiny bit of anger to live in our heart. Believing that beauty looks a certain way. – We’re taught to believe that miniature waists and perfect tans are beautiful. We’re made to believe that blonde hair with blue eyes will win every time. But the truth is originality is beautiful. Big brown eyes, green eyes, blue eyes alike. Curves, and lots of them. Your natural skin tone is beautiful. Your hair color and your smile. Your voice, your laugh, and your personality. Every inch of you that shines with your unique essence. You’re truly beautiful, just like the rest of us. Letting your expectations run rampant. – Everyone has their own challenges, everyone has their own journey. It is meaningless to compare one with the other. Always love and accept the real people in front of you, not the fantasy of who you hope and wish these people could become. Disrespecting others. – Treat people the way you want to be treated. Karma is only unkind if you are. No matter what happens in life, be good to the people around you. If you do, you’ll leave a great legacy behind regardless of the dreams and ideals you choose to pursue. Disrespecting yourself. – Being kind to yourself in thoughts, words and actions is just as important as being kind to others. The most painful thing is losing yourself in the process of loving others, and forgetting that you are special too. Read Pulling Your Own Strings . Putting up with unfaithful friends and lovers. – The people who want to stay in your life will always find a way. Real friends and lovers stay faithful. You shouldn’t have to fight for a spot in someone’s life. Never force someone to make a space in their life for you, because if they truly care about you, they will create one for you. Rushing love. – It’s not hard to find someone who tells you they love you, it’s hard to find someone who actually means it. But you will find them eventually. So don’t rush love – don’t settle. Find someone that isn’t afraid to admit they miss you. Someone that knows you’re not perfect, but treats you as you are. One who gives their heart completely. Someone who says, “I love you” and then shows it. Find someone who wouldn’t mind waking up with you in the morning, seeing your wrinkles and grey hair, and then falls in love with you all over again. Neglecting your most important relationships. – Relationships built on a foundation of love and respect can weather many storms and earthquakes. This foundation can be checked, maintained and kept healthy with generous doses of acceptance, forgiveness, listening, gratitude and considerate actions. Trying to control every last detail about everything. – Sometimes it’s better not to assume, not to wonder, not to imagine, and not to obsess. Just breathe, do what you can, and have faith that everything will work out for the best. When you least expect it, something great will come along – something better than you could have ever planned for. Never taking risks. – Life is inherently risky. There is only one risk you should avoid at all costs, and that is the risk of doing nothing. Get out there and make something happen, even if it’s just a small step in the right direction. Strive for progress, not perfection. Read The 4-Hour Workweek . Giving up on YOU. – Sometimes life doesn’t give you what you want; not because you don’t deserve it, but because you deserve better. No matter how many times you break down, there should always be a little voice inside you that says, “NO, you’re not done yet! Get back up!” That’s the voice of passion and courage. Life is a journey, often difficult and sometimes incredibly cruel; but you are well equipped for it as long as you tap into your talents and gifts, and allow them to flourish. Number 4 is spot on! Really well said! I agree with Maikal. And I’ll also throw a shout out to #10. Because what goes around comes around in this world. Your site is a beauty! Impressive in the way it inspires me whenever I need a little boost. I just want to thank the team behind this site, for all the encouragement that your site as brought to my life and others. Seriously, I love you all. Love this! Definitely #4 and 17 are so true! Thank you for sharing. This really hit home, thank you! I like the whole post! I really love no. 3… someday there’s someone that really meant for you. Waiting, waiting and waiting. Waiting for the perfect moment that never arrives. Good way to let life pass you by. Great reminder! As always, I can’t wait to read your posts. I share them on FB, I think of them throughout my day, I even find myself praying about them. You are making a positive difference in the lives of your readers… thank you. Such sound, logical, clear advice well worth following! I enjoy and rely on your site to stabilze my thoughts and relieve my mind of stress! Bless You both for taking the time to spread these thoughts. What else I could say after following this blog for almost more than a year… I follow almost all the tips and believe me that you guys have helped me shape myself up as a person that I wished to be few years ago. I am happier than I have been in a long time. I am so grateful that our paths crossed Marc and Angel. May god bless both of you with a long, happy life!! I have been reading your wonderful posts for some time, often sending them on to my two daughters. I continue to thank you for the comfort, inspiration, courage inducing and sense of serenity that your thoughtful messages have generated in my family’s life. I just HAD to read a couple of points in this list! TO not settle, to not force someone to create time for you and to allow people around me to change and not try to adapt to the changes in them. Thank you Marc and Angel, I just find infinite peace after reading your articles. Love! I like #17: “Sometimes life doesn’t give you what you want; not because you don’t deserve it, but because you deserve better.” … a huge inspiration while dealing with one difficulty after another. Love #4 – 6 months ago I went through what I thought was an unbearable situation; I let my emotions go and been fighting ever since, and feel stronger than ever. Everything happens for a reason, I am grateful and thankful. Love your posts, keep them coming! Yes, great list. So many people think they can run away from their problems, but that doesn’t work… as we all eventually learn. I’m in the middle of the worst year of my life. It’s stared from #4 which lead to the rest 16. Will put this in my morning read for a while until I can remember without reading them. I would say that the biggest challenge most people face has to be #11. It’s at the core of most of the problems we face in some way. I also would add that along with #5, ignoring your problems won’t make them go away. In fact, the longer they’re ignored, the more they get worse in most cases. Thank You… I needed this the most today. You guys are awesome! Keep up the good work. I have come a long way over the past year and credit much of my healing from the advice your articles provide. You have been the wise best friend in my corner always reminding me of what I already know but need to hear over, again and again. 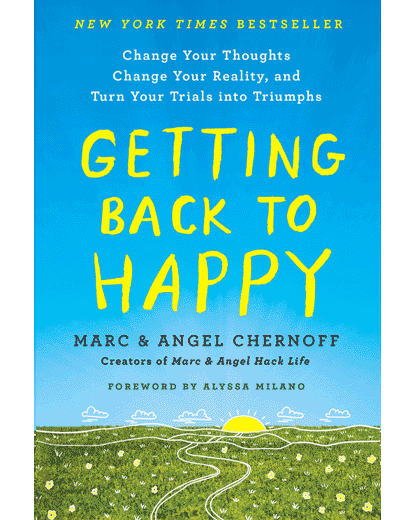 I truly thank you Marc & Angel for helping me look within, face fears and truths that were easier to avoid, and find the strength to overcome adversity, all while still having the courage to give unconditional love and still respect myself. I especially appreciate your delivery, though it is very matter of fact, it is still so full of compassion. Again, thank you and be blessed. Well said! God didn’t put us on earth for a free ride to self happiness,to be lazy and get rewarded for it and not to be responsible for actions, He put us here on earth to carry out his plan for our lives. Marc and Angel this post demonstrates this to a T. Note: It took me 50 years to figure this out, please everyone don’t waste your time! Make your time count! By far one of the most insightful posts I have read in a long time on any blog. You hit the nail on the head so many times for me. It was sort of strange, almost in my “head”, which for me weirded me out a bit! ha ha! Keep up the great work and thanks again for sharing your thoughts and wisdom with the rest of us! I’ve had so much negativity in my life from such a early age.I’ve had to learn these positive lessons the hard way and I know they are true. the thought about people will make room for you is great. I’ve tried too hard in the past to make the room on my own and winded up just making a mess of things. It’s funny that usually they were people that were not good for me in the first place. thank-you for the inspiration to wait for the right, good people I’d be proud to know and call friends who will like me as is. YESS! Bring it on people! keep moving forwarddd.. This is exactly what I needed to read this morning, thank you! This was very inspiring. It really touched my life. Wonderful post. So much of what I needed to hear today and in this moment. Thank you! Love this! #13 and #17 are so true!